That’s right… the IRS has a central role in implementing the massive ObamaCare law. The most obvious way that the agency is involved is through collecting the 18 new taxes in ObamaCare. Despite Obama’s promises not to raise taxes on Americans making less than $250,000 annually, most of these taxes will hit the middle class. But that’s not all. The IRS has 47 new duties and enforcement powers under the law and has requested 2,000 more agents to help implement ObamaCare in 2013 alone. These duties include collecting information on health insurance plans by requiring employers to inform the IRS on whether an employee has insurance. You will be forced to send a health insurance verification form from the IRS with your federal tax return. Why should the IRS be collecting our personal health information? Frankly, that is none of their business. Another IRS duty will be penalizing individuals that do not purchase health insurance. Starting in 2014, all individuals must purchase government approved health insurance or face a fine. The penalty for non-compliance is $95 (or 1 percent of income, whichever is higher) in 2014, $325 (or 2 percent of income) in 2015, and $695 (or 2.5 percent of income) in 2016. Never before have individuals been forced by the government to buy a product. This is a clear violation of our individual liberty. Many people, especially young and healthy people, rationally chose to pay for their health care out of pocket instead of buying health insurance. They may only visit a doctor once or twice a year—and probably won’t need any expensive procedures. As you may imagine, this doesn’t please insurance companies that want everyone to buy health insurance. Is it any wonder that major health insurance companies were the biggest supporters of a law that punishes people for not purchasing their product? 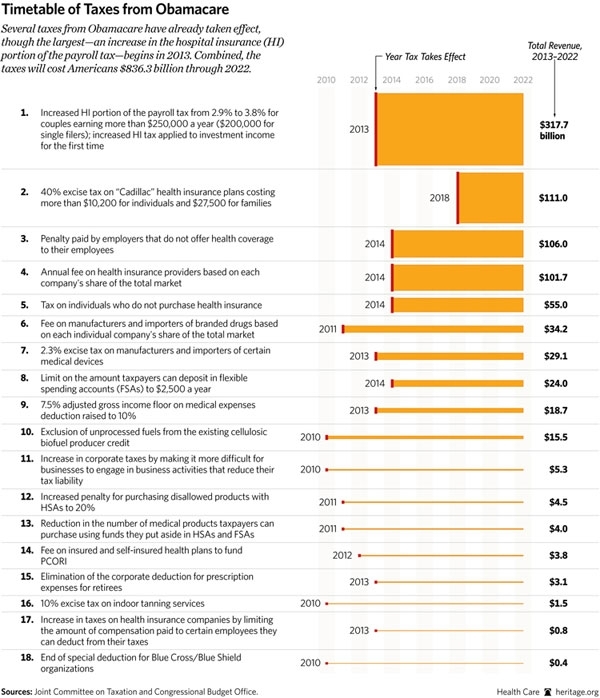 ObamaCare isn’t about “compassion” or improving health care, it’s just a big payoff to the health insurance industry. Also, the IRS will provide federal subsidies for people who buy insurance through government “exchanges.” In order to administer the subsidies, it will be the duty of the IRS to collect personal information to see if individuals are eligible for coverage on an exchange or Medicaid. The IRS will additionally use a massive new database called the Federal Data Services Hub to collect information from IRS, HHS, DHS, DOJ, and States for ObamaCare enforcement. The scandal-ridden IRS and DOJ working together to gather personal information is a recipe for disaster. The IRS implementing ObamaCare should raise red flags. We should absolutely not give the IRS more control over our personal life. Or better yet: ObamaCare should be repealed. Click here to send a message to Congress: Keep the IRS Away From Your Healthcare.